To say that this book is disappointing would be an understatement. 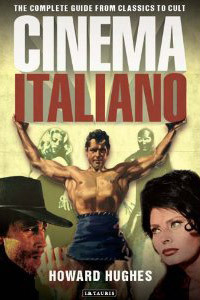 It covers Italian cinema in different categories (PEPLUM, Euro crime, Spaghetti Western, etc). Of course the section about the PEPLUM genre interested me the most. After 20 minutes, I was finished with the 70+ pages chapter and put the book down...for good. There's nothing much really to review here as the book is basically an index, with the author describing the story (often incorrectly) with a quick one line or two line review. That's it. I can't even begin to decide which part of the book was most disappointing or offensive. It's pretty clear PEPLUM films are not his cup of tea even if he starts the book with the genre because of the enormous success of HERCULES started the ball rolling. I'm certain he didn't see some of the films. The synopsis are that simplistic. Very little details. For example, his review for TRIUMPH OF MACISTE on page 14 made me realize this. His brief synopsis and review (claims the score is Chinese-sounding! What?) is simply terrible, on many levels. Not only the brief review is filled with errors (he misspells the actress' name that played Queen Tenefi) but proceeds to review the US cut of the film, dismissing it as filled with stock footage from MACISTE IN HELL. Hmm, the original ITALIAN version (you know it is CINEMA ITALIANO...) doesn't have those added scenes. American producers added those pointless scenes for the US market. Hughes didn't even bother trying to find the original version and compare it with the US cut. That's not all. In the review for KINDAR THE INVULNERABLE he writes that Mimmo Palmara overplayed his role and that his exuberant laugh was annoying. Doesn't the author realize that the terrible English dubbing is to blame here and not Mimmo or the film itself? I mean, come on. All the reviews are like this throughout. Very lazy stuff. The super brief reviews are underwhelming, often dismissive: he describes the Ten Gladiator films as "powered along by their own dumb, illogical momentum." Wow! In my quick scan of the book, I easily found several glaring mistakes. He wrote that THE SPARTAN GLADIATORS' alternative title is THE SECRET SEVEN. Eh, no. THE SECRET SEVEN is a different film altogether also starring Tony Russel. The chapter dedicated to the PEPLUM genre is divided in three sections: Mythological Epics, Costume Adventures and Sword & Sandal Spectacles, which makes little sense as many films from one section easily overlap into another section. Big titles are also missing even if the book tout itself as "The Complete Guide from Classic to Cult." It's not. Where's SAPPHO - VENUS OF LESBOS directed by Pietro Francisci? THE BACCHANTES? According to the author, the measuring stick for these kind of films are set by Hollywood and writes that many people expected De Mille stuff when seeing these Euro films and got short-changed. Huh? Things like this makes me wonder: is this book really about CINEMA ITALIANO? In this age of blogs and IMDb reviews and such, these kind of books need something more, something extra to make them worth buying. The other chapters on the other genres are probably better but from the chapter on the PEPLUM genre alone this book wasn't worth purchasing at all. There's only one thing to do. Write an authoritative book of your own. It wouldn't take that much time, in that most of it is already written and illustrated within this blog. It could be just a cut and paste job and still be better than anything else out there. I'd buy a copy, even if you only self-published it. I agree with Steven you should straighten these so called "Know It All's" out with your own book or cut and paste job and let them know about it. I would also buy it. Thanks for the great review. I had considered buying it but not now.